Like some sort of weird hybrid between a spaghetti western and Muriel’s Wedding – fitting, seeing as that film’s director P.J. Hogan also co-writes the script here alongside director, and wife, Jocelyn Moorhouse – The Dressmaker is every bit as barmy as the comparison suggests. It starts off straight-laced enough, with a cigarette-smoking woman named Myrtle “Tilly” Dunnage (Kate Winslet) returning to her outback childhood home of Dungatar, Australia, where she was ostracised and eventually expelled for apparently murdering a young boy, to care for her aging mother “Mad” Molly (Judy Davis). Tilly’s undeniable talent for dressmaking, having studied it in Paris, leads to the spiteful community desiring her skills for their own gain, but will it be enough for them to forgive her completely for what she might have done? It won’t be easy, because the majority of the townsfolk are actually horrible, HORRIBLE people – thankfully, intentionally so. As we see over the course of the film, they are uncomfortably self-serving and one-track minded, and you have to see Winslet’s Tilly as some kind of saint for her to be able to put up with their despicable nature. It’s also evident that Tilly is, and always has been, far too good for this place, because not only is she one of the few likable people in the entire place but is also much more open and logical whereas everyone else is so closed off and reluctant to forgive and forget. It’s stated early on that Tilly has been travelling since her childhood expulsion, going from London to Milan to eventually Paris, and all that experience in other places outside her home town and even her home country has given her more of an understanding to how the world actually works; meanwhile, since nobody else has even bothered to get further than the next town over, it’s like stepping onto another planet when she returns in the opening scene. You can think of the film as a cautionary tale, describing what could happen if you choose to remain where you’ve been your whole life and never exploring the world beyond your town’s sign; arrogance seeps in, causing friends to become ostracising nincompoops and deciding that the world revolves around only what you know. Ironically, the one person who was sent away by those very people became the most rounded individual out of all of them; and that’s because they unknowingly gave her a life they never could have. A cautionary tale, sure, but one that is also strange and exceedingly campy at the same time – and we’re not just talking about Hugo Weaving’s cross-dressing policeman. The performances are, for the most part, very over-the-top and cartoonish, like if someone adapted a Beano comic strip and a Roald Dahl book simultaneously, making them seem more like caricatures than actual people. This is a film where subtlety simply doesn’t exist, and we know instantly who we like and dislike (mostly the latter) based on their most basic of attributes – we, for instance, can understand immediately that Liam Hemsworth’s attractive farm handler is one of the better people there, because he’s much less outlandish than the rest of them – which makes this fairly light viewing meant to entertain more than challenge its audience. It attracts the kind of laughs that The Lady in the Van managed to get, its light-heartedness eager to play well with a slightly older crowd. However, there are several moments of black comedy that sometimes threaten to go a step too far in the wrong direction, and it swings the tone back and forth to a point where it becomes extra-queasy. One such scene that is meant to inspire sad emotions suddenly has its rug pulled by a character’s questionable costume choices. 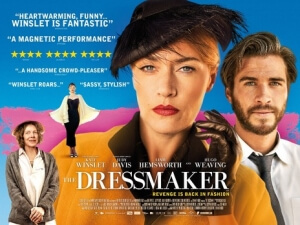 It’s a perfect example of what The Dressmaker ultimately is; a sly cautionary tale that’s caught up in its own campy eccentricities and severe tone shifts to deliver its true intentions honestly. It’s a light-hearted romp that’s enjoyable to a point, but it has a lot of baggage that threatens to pull it from the seams. The Dressmaker is a sly cautionary tale that’s caught up in its own campy eccentricities and severe tone shifts to deliver its true intentions honestly.